Xiaomi Mi Max 3 launch event is scheduled for July 19 in China, which is just a few hours away. In classic Xiaomi tradition, renders and specifications of the upcoming phablet have been revealed along with a teaser of its price tag. Xiaomi co-founder Lin Bin after having released high-quality renders for the smartphone has now posted all major specifications ahead of launch. 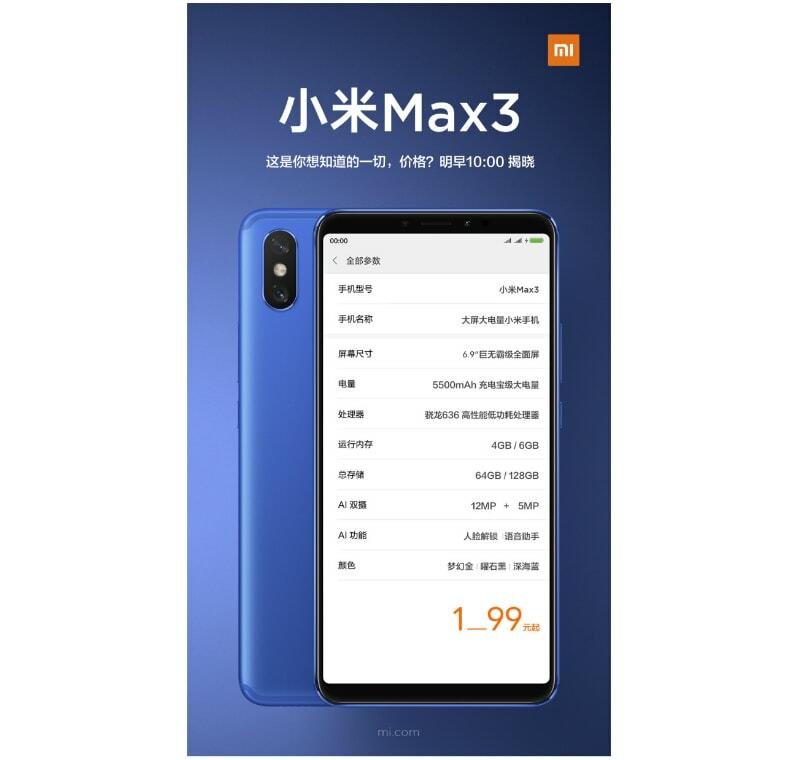 Launch of the Mi Max 3 is set for 10am CST (7:30am IST) on July 19 in China. Availability details have not been revealed yet, but we can expect it to go on sale within days of the launch. As per a Wednesday teaser post on Xiaomi’s Redmi Weibo account that also lists most of the specifications, the Mi Max 3 will sport a 6.9-inch display, a 5,500mAh battery capacity, Qualcomm Snapdragon 636 SoC, 4GB RAM/ 64GB storage and 6GB RAM/ 128GB storage variants, and a dual rear camera setup with a 12-megapixel primary sensor and a 5-megapixel secondary sensor. Apart from that, the post reveals that the price of the smartphone will be anywhere between CNY 1,099 and CNY 1,999 (around Rs. 11,200 to Rs. 20,400). However, if last year’s Mi Max 2 is a yardstick to go by, the price tag might be in the upper end of that price spectrum. The post also adds that it will be available in Black, Blue, and Gold colour variants. Apart from that, the Mi Max 3 will arrive with AI-based Face Unlock, Bokeh effect in selfie camera, and an AI-powered digital assistant. 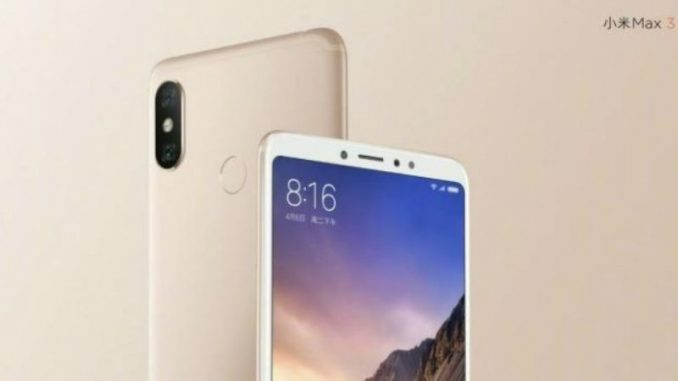 Separately, a post by Xiaomi co-founder and current President Lin Bin has outed the same specifications of the smartphone, adding that on the front, the handset will sport an 8-megapixel sensor for selfies and video calling, and that the 6.9-inch panel will have an 18:9 aspect ratio. Bin also says that the 5,500mAh battery will have support for Quick Charge 3.0.